Preschoolers and young beginners need LOTS of activities to keep them engaged during lesson time. Keep those “rainy days” at bay: off-bench activities are the perfect cure for tired or restless students! These Activity Charts will help keep you organized so that you can spend less time planning and more time having fun learning with your littles. 2) Teaching tips to help you get started! Download our free "Rainy Day Toolbox" and start getting organized today! 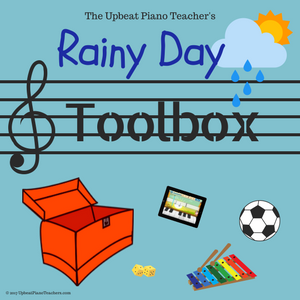 Be sure to LIKE and FOLLOW our Upbeat Piano Teacher Facebook page for FB Live videos about games and activities you can add to your "toolbox"! If you have a game or idea you'd like to share, comment and let us know!